Green Bank is part of the US Radio Quiet Zone. Green Bank is part of the US Radio Quiet Zone, where wireless is banned across 13,000 sq miles (33,000 sq km) to prevent transmissions interfering with a number of radio telescopes in the area. 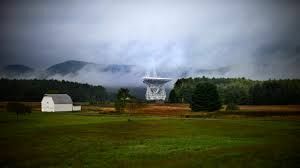 The largest is owned by the National Radio Astronomy Observatory and enables scientists to listen to low-level signals from different places in the universe. Others are operated by the US military and are a critical part of the government's spy network. As a result of the radio blackout, the Quiet Zone has become a haven for people like Diane, desperate to get away from wireless technology.